Whether you’re into big crowds and bright colours, checking out some of the world’s best cinema or spoiling your four-legged friends, Sydney ticks just about every box this month. Sydney’s set to burst into colour once again for the infamous Vivid festival, and it promises to be bigger, brighter and bolder than ever before. This year, the Opera House sails will feature a futuristic tableaux of sea creatures, bird plumage and plant life set to a transcendent soundscape by Brazil’s legendary sound wizard Amon Tobin. Wild. If wading through big crowds isn’t your bag, fear not: Academy Award-winning director Oliver Stone will be appearing in conversation with Margaret Pomeranz at City Recital Hall, and performances by the likes of Fleet Foxes, Sampha and Air should leave music lovers feeling very pleased. There’s a whopping 660 events going on across the city, so be sure to check the website for full details. Cinephiles rejoice, because Sydney Film Festival is back. Known for being one of biggest film festivals in the world, this year is no exception with a jam-packed schedule featuring exclusive premieres, short films, animated features and stacks more. Be sure to check out David Stratton’s selection of essential films from one of the cinematic greats, Akira Kurosawa, who influenced George Lucas and Martin Scorsese. The program this year also celebrates the weird and wonderful with a collection of punk rock gems and creepy sidebar features guaranteed to “make your spine tingle and your pulse quicken”. Count us in. Although technically part of the aforementioned Vivid Festival, we had to give Curve Ball its own mention because it’s just so. freaking. exciting. Organised by festival heavyweights Fuzzy, this year’s ball will be graced by dance legends like Safia, Client Liaison, Motez, Tkay Maidza and more. Not only do those artists pretty much guarantee a super fun happy time dancing like you’ve never danced before, but you also score cool points because it’s all taking place in the uber hip, industrial space Carriageworks. Totes trendy. Yep, Woof Fest is pretty much exactly what it sounds like – a festival for our woofing counterparts. 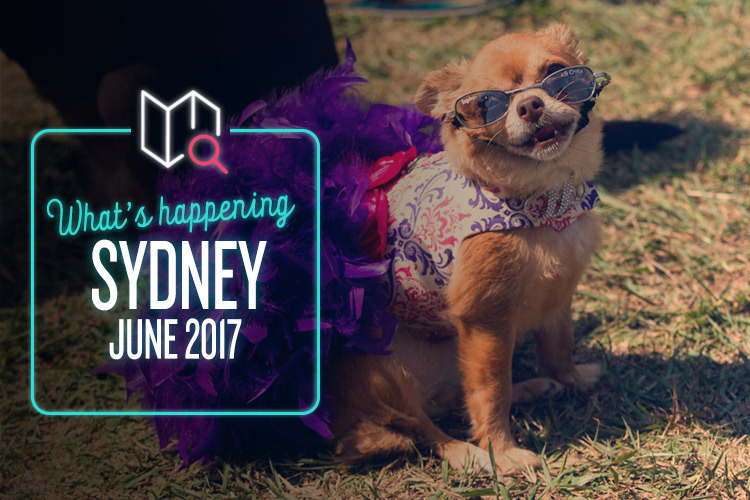 More specifically, it’s a free, community festival packed with live entertainment, dog skills demos, expert advice, kids’ activities, more than 50 stalls filled with doggie goodness and even a dog fashion parade. Sure, your furry friend might like being dressed up as a hot dog as much as he likes a trip to the vet, but that’s not the point. Because he just looks so adorable dressed up, doesn’t he? What a good boy.